In Voices from the Set, Tony Macklin shares with his readers the interviews he conducted during the 1970s with many of Hollywood's greatest stars. Because it was an era where the Old Hollywood was still extant, and the new cinema was burgeoning, he was able to meet the old with the new-actors, directors, producers, writers-and make some of his own memories along the way. Interviews with old masters Alfred Hitchcock and Howard Hawks are juxtaposed with the new breed Martin Scorsese and Alan Rudolph and the mavericks Robert Altman and Sam Peckinpah. Icons such as John Wayne and Edith Head are included, as well as relative newcomers Stockard Channing and Richard Baskin. 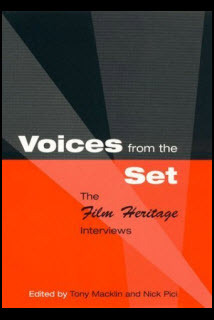 Voices from the Set is a unique vignette of Hollywood history, a snapshot in time, ideal for the film buff, film historian, for anyone with an interest in the intriguing personalities that made it what it is today. This book is an opportunity not to be missed.